My wife and I are finally on the same page when it comes to eating healthy. We both want to lose weight, get fit, improve our energy levels and reduce the impact of stress whilst becoming more focused and alert. Part of this change is adopting a ketogenic (keto) and paleo-friendly diet. For those of you who don’t know, the ketogenic diet is a high-fat, adequate-protein, low-carbohydrate diet that in medicine is used primarily to treat difficult-to-control epilepsy in children. The diet forces the body to burn fats rather than carbohydrates. This die helps your body burn fat more effectively. On a ketogenic diet, your entire body switches its fuel supply to run mostly on fat, burning fat 24/7. This happens because when insulin levels become very low, fat burning can increase dramatically. As a result, it becomes easier to access your fat stores to burn them off. This is great if you’re trying to lose weight, but there are also other less obvious benefits, such as less hunger and a steady supply of energy. This may help keep you alert and focused. 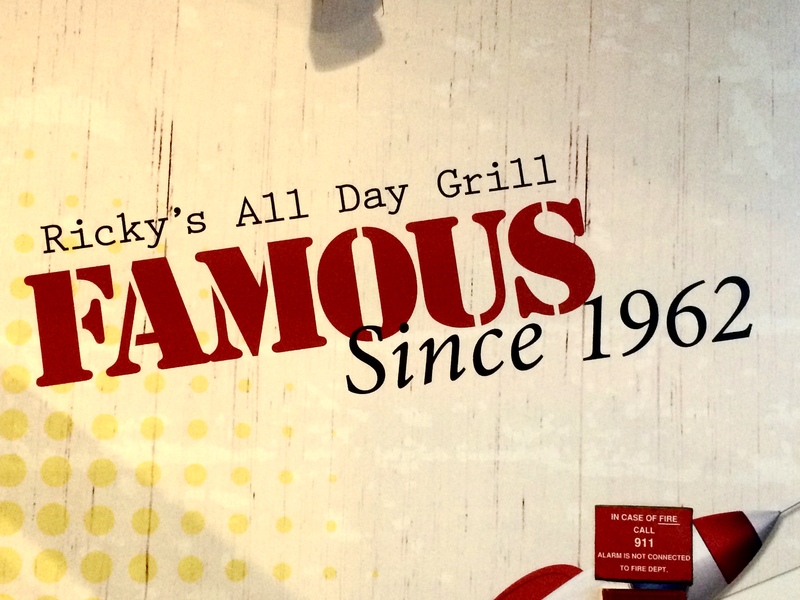 As part of this transition to a healthier diet, we recently visited Ricky’s All Day Grill in order to enjoy a delicious brunch with our family. 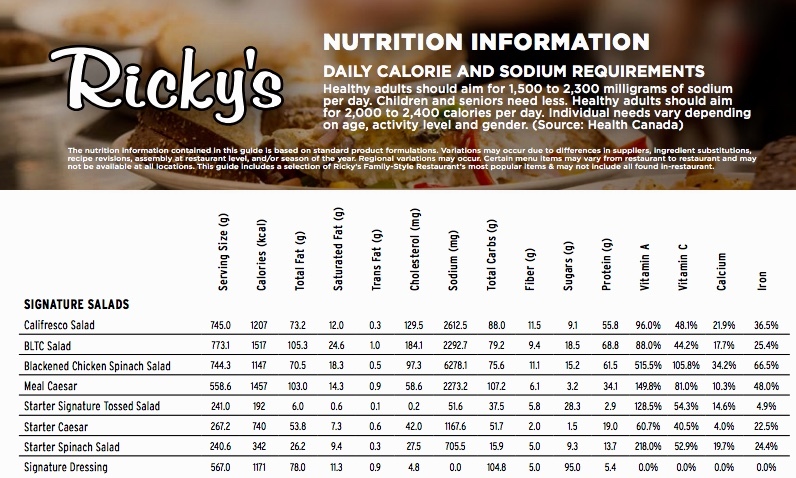 Ricky’s is a restaurant chain in western Canada that was founded in 1962 as a family breakfast house. The chain was originally named after the founder’s son “Ricky”. 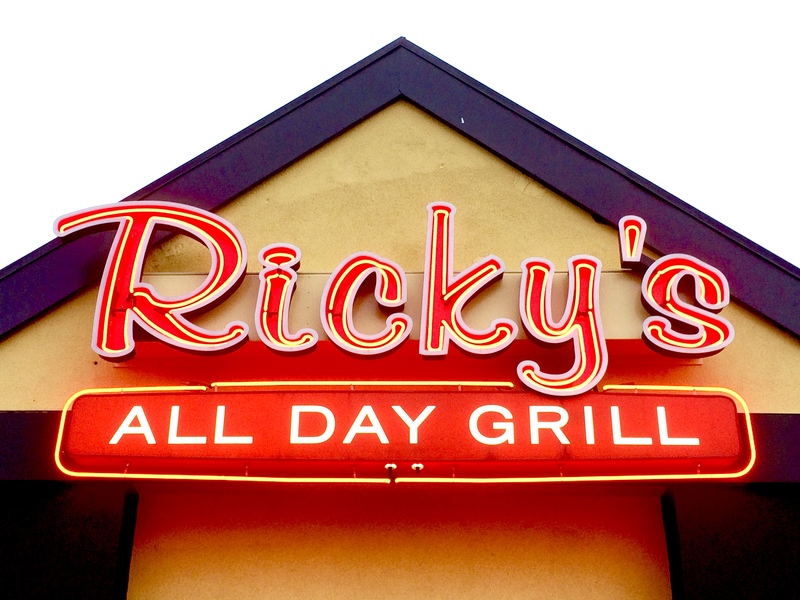 Ricky’s All Day Grill has become one of the fastest growing mid-scale family restaurants with 85 locations across Canada (and more under development). This restaurant is well known to be all about great service, great people and great food. 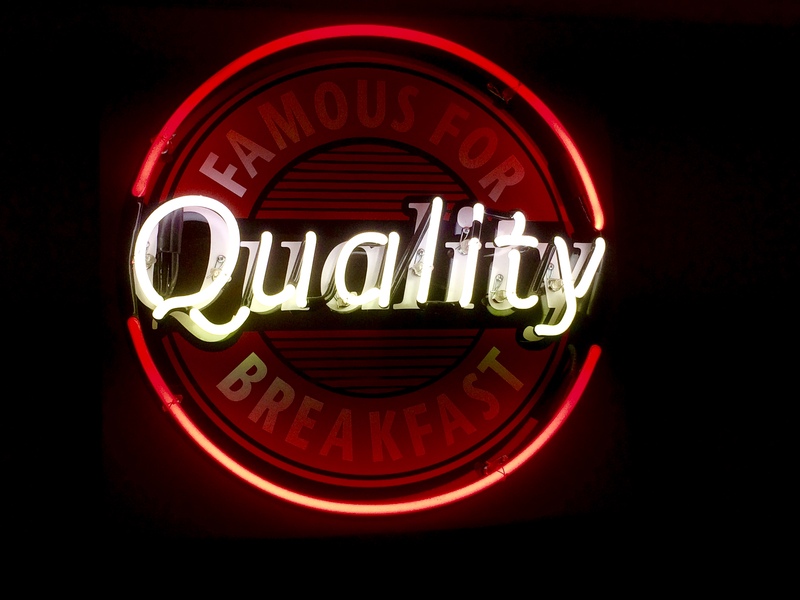 Their commitment to friendly service sets the gold standard for our industry and our innovative menu and food features are designed to bring customers in – and keep them coming back. Ricky’s is committed to uncompromising food quality and freshly prepared recipes using high quality, sustainable ingredients. 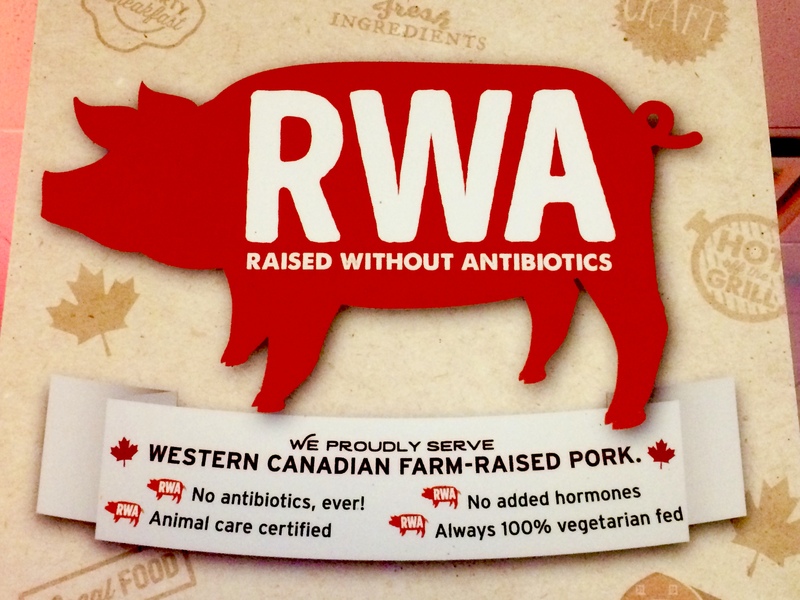 For instance they are proud to serve Rainforest Alliance Certified coffee and breakfast meats raised in Western Canada without antibiotics and hormones. They also offer fresh never frozen ½lb certified Alberta Angus Beef burgers topped off with Windset tomatoes or fresh avocado. Other options include hand-battered Southern Style chicken tenders, hand-and-beer battered Ocean Wise cod fillets, or gourmet sandwiches made to order! More tasty treats offered on their menu include hot and crispy, fresh cut Kennebec fries. 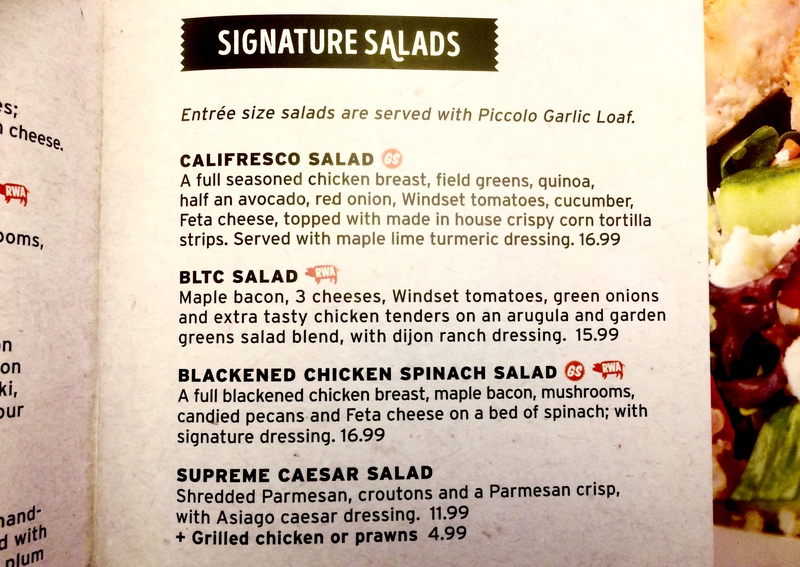 I ordered one of Ricky’s Signature Salad Entrées…the Blackened Chicken Spinach Salad. To be honest I was blown away by the taste of the Blackened Chicken. 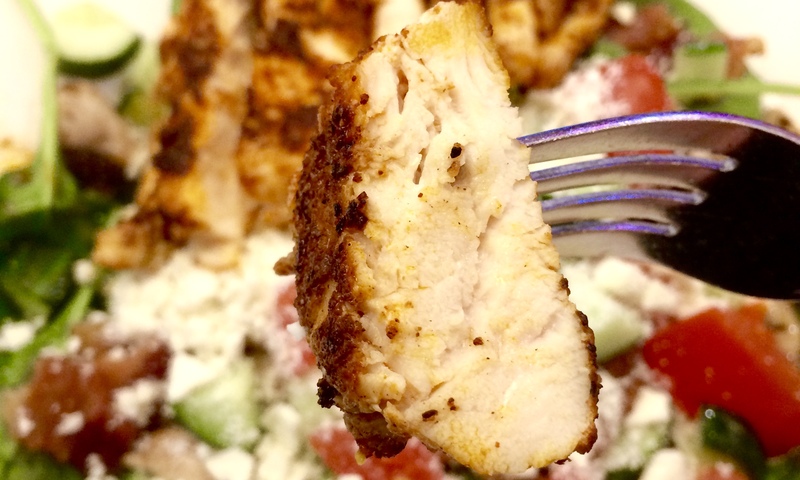 For those of you who don’t know about Blackened Chicken, it’s basically RWA chicken breast (eg. Chickens raised in Western Canada without antibiotics) seasoned and then cooked in a way that intentionally flirts with the line between burned meat and meat that is simply done, in contrast to typical grilling which takes a more leisurely approach to cooking it. To get that wonderful blackened taste, the chicken is first dipped in melted butter and then dredged in a mixture of herbs and spices, usually some combination of thyme, oregano, chili pepper, peppercorns, salt, garlic powder and onion powder. 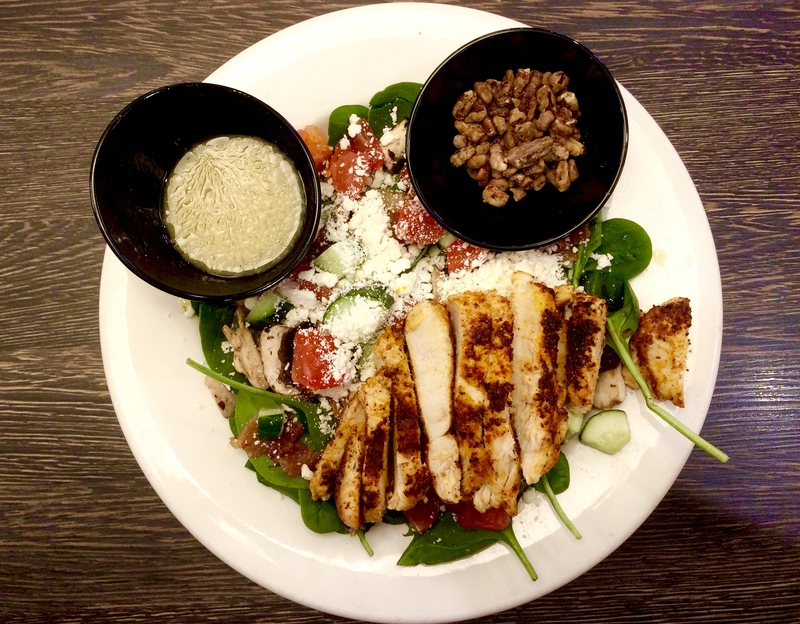 Although this salad costs $16.99 CAD, it’s definitely worth the price just for its amazing taste. 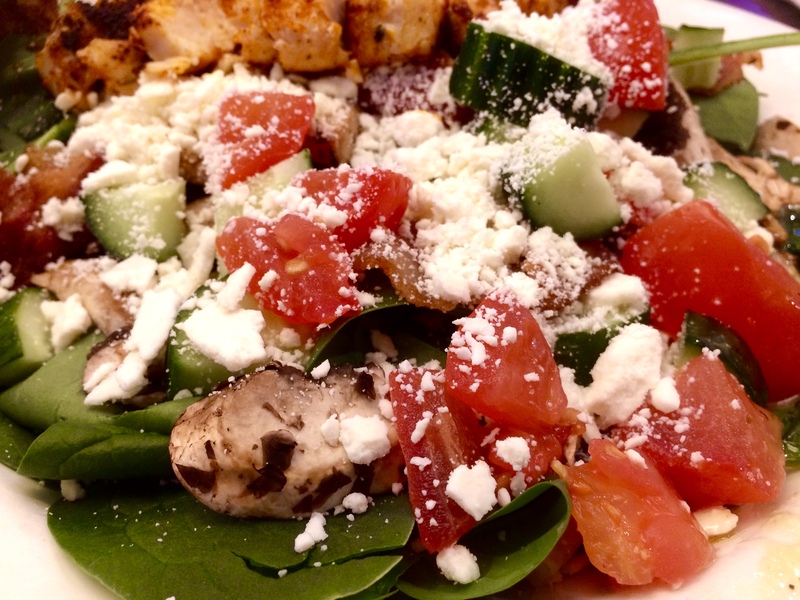 To make it so delicious, they’ve added in maple bacon, mushrooms, feta cheese, cucumbers and tomatoes all on a bed of spinach. It does clock in at a very high 1174 calories, and carbs at a whopping 64.5 net grams. One way to bring down those carbs a bit is to remove the candied pecans (Roughly 6 grams of net carbs), as well as eat a bit less of the chicken. 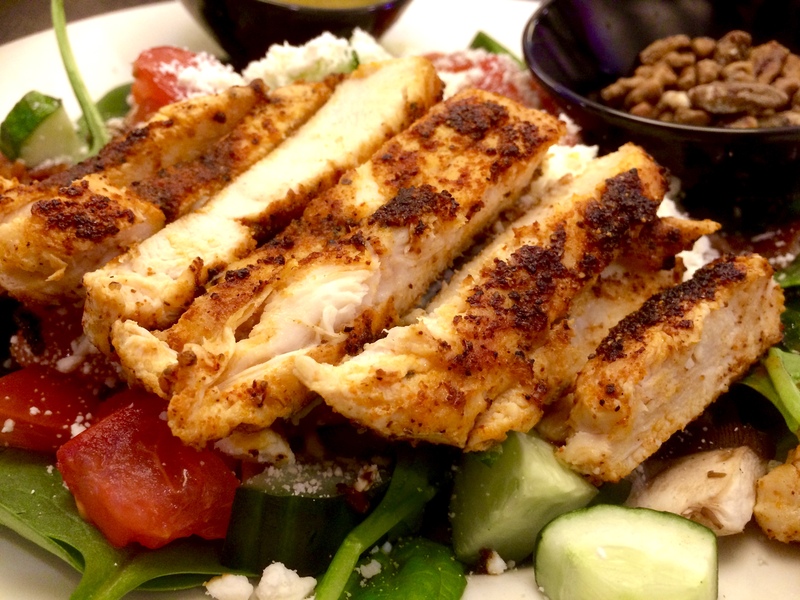 Another way is to make sure that you don’t use the dressing, which is very high in carbs (99.8 net grams of carbs). So, basically in order to make it ketogenic (Paleo) diet friendly, watch what you eat. 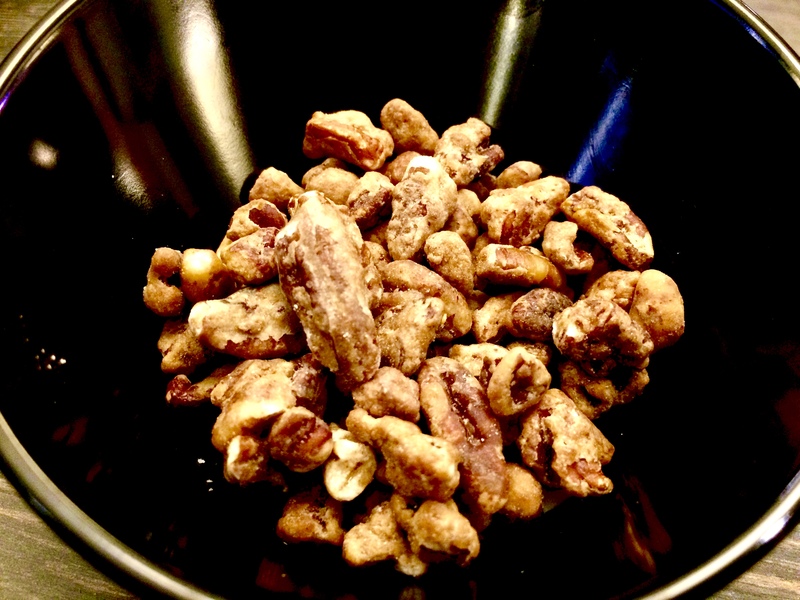 (Btw…the pecans make a great dessert, but only if you feel like you have extra carbs to spare). 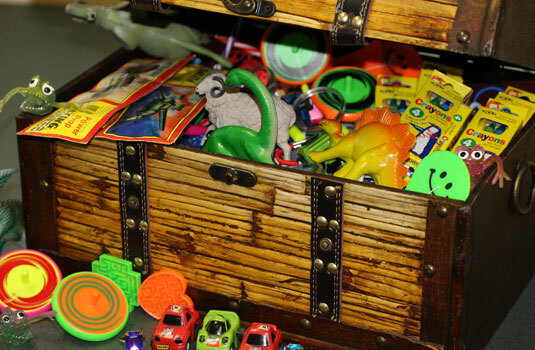 For those of you who have kids, note that every kid who eats at Ricky’s gets to choose their own special prize from their treasure chest of goodies. Also, they have a very robust Kids menu with delicious and hearty options. 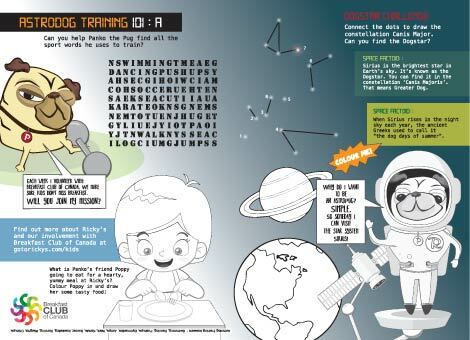 Another friendly tip is to fill out the short form to sign up your child(ren) for Ricky’s birthday club. Then, two days before their birthday you should receive an email voucher for a free kids meal. Just bring the email into your closest Ricky’s to treat your child(ren) on their birthday. 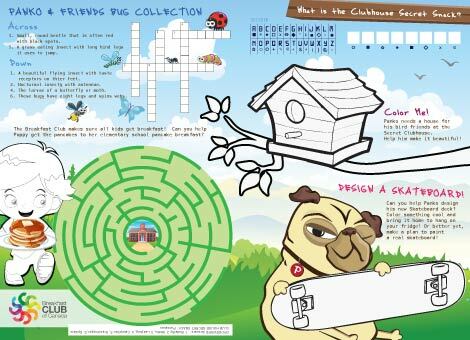 Kids can also enjoy their activity booklets, specially made to keep kids busy with some fun-filled puzzles, and drawings. 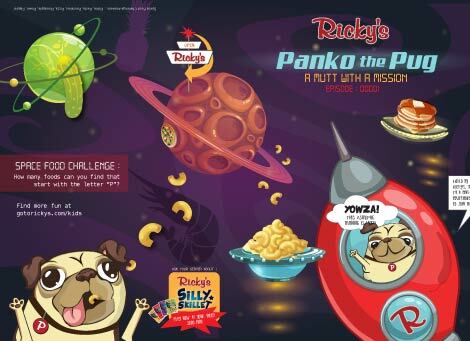 These include following the adventures of Panko as he leads you through interesting games and activities. 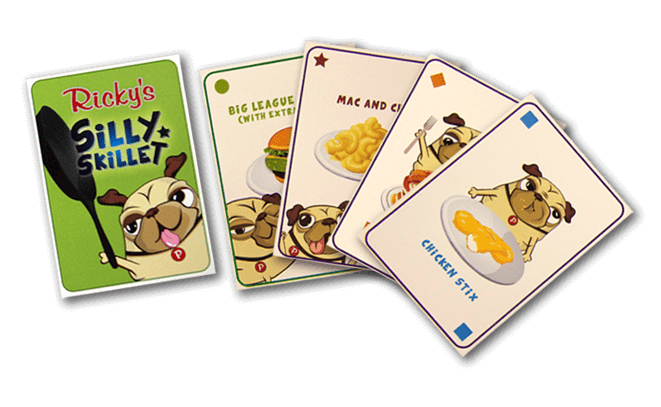 Kids can also play the Silly Skillet Card Game (a match card game) while you wait for your dinner. Nothing like a little friendly family competition!